On the strength of its expertise and historic reputation with wine professionals, EuroCave Professional has created a brand completely dedicated to the requirements of professionals and positioned itself as the go-to brand for sommeliers! 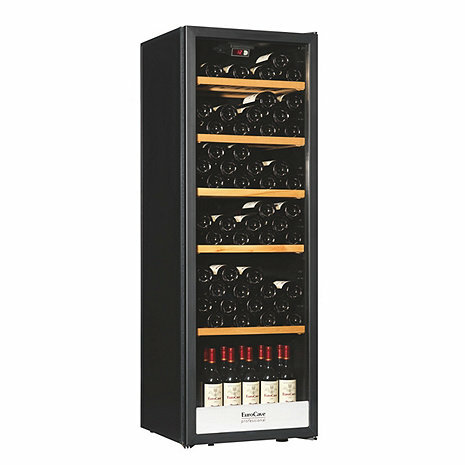 The 1000 Series comprises 2 types of wine cabinets for bringing your wine to the correct serving temperature. Functional and able to be flush-fitted, the 1000 series is the ideal range for limited budgets. The 1000 Series is able to bring your wine to the correct serving temperature and is the ideal cellar for limited budgets. *A Note About Bottle Capacities: Wine Enthusiast's stated bottle capacities is always based off of storing all standard Bordeaux size bottles, which are generally 12" H and 2 7/8" W. 750 ML bottle sizes can vary greatly in both height and width, so be sure to check the bottles in your collection as larger bottles (i.e. Pinot Noir, Burgundy, Syrah, Champagne, etc.) will lower capacity. If up to 50% of your collection consists of these taller/wider750 ML bottles, capacity can be lowered by 10-15%, if over 50% of your collection consists of these taller/wider 750 ML bottles, capacity can be lowered by up to 25-30%. *A Note About Bottle Capacities: Wine Enthusiast’s stated bottle capacities is always based off of storing all standard Bordeaux size bottles, which are generally 12" H and 2 7/8" W. 750 ML bottle sizes can vary greatly in both height and width, so be sure to check the bottles in your collection as larger bottles (i.e. Pinot Noir, Burgundy, Syrah, Champagne, etc.) will lower capacity. If up to 50% of your collection consists of these taller/wider750 ML bottles, capacity can be lowered by 10-15%, if over 50% of your collection consists of these taller/wider 750 ML bottles, capacity can be lowered by up to 25-30%. Can additional shelves be ordered? Can 1.5 L bottles or full cases be stored in the bottom? BEST ANSWER: I believe you can order extra shelves because there are tracks for them. 1.5L bottles can be stored upright. You can really put a case of wine in it. I purchased this until because I wanted it to go in a utility closet so I needed a specific size. It does not fit as many bottles as described. If I had to do it again, I would get a bigger model. You can order extra shelves and you can take shelves out in order to store large format bottles or a case in the bottom. Adding extra shelves reduces the storage capacity and taking shelves out and storing loose bottles stacked several bottles high will increase storage capacity. Does this unit provide humidification? BEST ANSWER: The Eurocave 1125s does not provide active humidity, many other Eurocave wine cabinets do offer passive humidity. No, the EuroCave Professional 1125S Wine Cellar does not provide humidification. What is the maximum shelf capacity for this unit? As I read that you are able to order additional shelves only when purchasing the wine cellar. The Professional 1125S comes factory packaged with 5 adjustable shelves only. You cannot add additional shelves to this unit at this point. However, you can add more rolling shelves to the similar Eurocave Chamber. Please call one of our Wine Cellar Specialists @ 1-800-356-8466 to answer any further questions you may have. 124 bottles is the capacity for this product. I like the depth of this unit at 21 inches but is there a version that has a greater storage capacity with this depth?? Yes, that is correct. Not with this depth. For more storage you can look at either the Comfort 266 or the Performance 283. Please call one of our Wine Cellar Specialists at 1-800-356-8466 for additional recommendations. There is a variety of products with 21" depths and varying storage capacity. How many extra shelves would I order with this unit to maximize storage? And am I able to add the shelves through online checkout? Thus unit has five adjustable shelves and can store 124 regular sized bottles of wine. The ability to add more shelves to this unit is not an option. What is the noise level in db? BEST ANSWER: Thank you for your inquiry. the decibel level on a Eurocave is 34-36. If you have any further questions, feel free to reach out to us at 800 356 8466. Thank you again. This is a wine cellar, which is a device used for storing bottles of wine at specified temperatures (this one keeps wine between 54 and 81 degrees Fahrenheit). There is no noise level as this is not an audio device. Can extra shelves used? Can they be purchased from you? At what cost? BEST ANSWER: No extra shelves can be used with this model, however they are adjustable. A suggestion might be looking into the bigger models with more capacity and shelf space to suit your needs. Yes, we found out from Eurocave that we now can get extra shelves but only when ordered at the same time the uni is orderedt. The cost is $59.95 per shelf. Is it possible to add shelves to this unit? BEST ANSWER: 1. The shelves in this unit are fully adjustable. You can add more if you choose. The answer to the question "How many extra shelves would I order with this unit to maximize storage? And am I able to add the shelves through online checkout?" contradicts this answer. The shelves in this unit are fully adjustable. You can add more if you choose. I currently have two silhouette wine refrigerators purchased from wine enthusiast. Both have problems with the thermostat. I have not been able to find a local service dealer to check them out. I am very disappointed in the conversations I’ve had with your company. I have been unsuccessful finding a local service provider. how I can find a local service provider? BEST ANSWER: Thank you for your question. Please call Wine Enthusiast at 800.648.6058 and choose option 2 to be connected to our technical department. decibel count for noise //?? BEST ANSWER: The decibel level range on the Professional 1125S is anywhere between 38-40dbl. The product manual says the 1125S is a multi-temp unit - is it? If so, how many zones and how are they controlled? BEST ANSWER: The Professional 1125S is is a single zone unit only, Eurocave does offer a multi-temp unit in the Professional Series 3181. Please contact our consultants at 800-356-8466 for more information on the Eurocave line. Since you have established that you can add shelves, can additional shelves be the rolling type? we need one that can be flush mounted. Does this have a trim kit? BEST ANSWER: Unfortunately on the Professional Series, shelves cannot be added to this model. You can add shelves to the Comfort and Pure models. Since this is rear venting, we would ask that one leaves 2-3" from the back of the unit to the wall. Can this unit be used as a built-in like in a kitchen? This model cannot be built in because it is not front venting. I recommend looking at our Performance 259 model which can be built in. Are the adjustable shelves rolling shelves or stationary shelves? BEST ANSWER: The shelves in this unit are adjustable but you can not add any additional shelving in the professional series. BEST ANSWER: The Eurocave 1125S is rear venting so the heat would dissipate from the rear. In terms of clearance, I would leave 2-3" from the back. BEST ANSWER: The warranty on the Eurocave Professional series has a 1 year in-home protection from date of delivery, including all parts , labor or replacement. The compressor is warrantied 5yrs from date of delivery. 1) What is the true width - spec sheet says 540mm which is 21.2in vs 21in on the site. Have a tight space at 21"
2) What is the electrical needed. Will a standard 115/120 work or do I need 220V? BEST ANSWER: These units are 21.2 inches wide and run off of 110 V.
Can door be fitted to open either way? This unit is only available as a right hinged unit only. Please call one of our Wine Cellar Specialists @ 1-800-356-8466 to discuss what Eurocave units can be hinged on the left side. There is water pooling in the bottom of the wine refrigerator, any suggestions? Help!! The product was not leveled when delivered. The manual is impossible to understand - mas far as adjusting the temperature. I called twice for support, and the tech told me he was not familiar with my model, and then I was put on eternal hold. I emailed twice without a response. Absolutely NO support. I have not been able to use this cooler since it was delivered, and it took 12 weeks. Temperature fluctuates approx. 3 degrees - I'm a little surprised & disappointed. The electronic control panel for setting the temperatures is hard to work. Also I cannot tell where the line is between the higher temp for the top part and lower temp for the lower part. Also, I have mostly red wine but I cannot store it in the lower half because it cannot get warmer than 47 degrees in the lower part. I should have gotten a single zone unit that I could keep at an even 55 degrees. Very practical and spacious unit for its size. However, I would add a lock to the door.